Mobile game company Gamevil has announced the launch of Party Slots on Google Play. 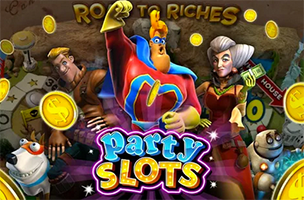 The company’s second social casino title of 2014, Party Slots looks to change the traditional slot machine genre into a social experience by seeing groups of players contribute to a single jackpot to offer greater rewards in the end. In Party Slots, gamers can play with up to six others in real-time multiplayer lobbies. The more players bet on each spin, the more experience points they earn, and the better their chance to hit it big on a jackpot. Bonus games can also see players greatly multiplying their winnings. In the Hi-Lo bonus game, for instance, players will need to decide whether the next number will be higher or lower than a given card. When players strike it rich, they’re encouraged to share their excitement with others via the game’s real-time chat feature. Party Slots is available to download for free on Google Play, while an iOS version is scheduled to launch in a few weeks. Check back soon to follow Party Slots on AppData, our tracking service for mobile and social apps and developers.